This article is about the ancient city Byzantium. For other uses, see Byzantium (disambiguation). For the city in the late Roman and the Eastern Roman or Byzantine periods (330–1453), see Constantinople. For the Ottoman and modern city (after 1453), see Istanbul. For the empire, see Byzantine Empire. Byzantium (/bɪˈzæntiəm, -ʃəm/ or Byzantion; Ancient Greek: Βυζάντιον, Byzántion) was an ancient Greek colony in early antiquity that later became Constantinople, and then Istanbul. Byzantium was colonized by the Greeks from Megara in 657 BC. The etymology of Byzantion is unknown. It has been suggested that the name is of Thraco-Illyrian origin. It may be derived from the Thracian or Illyrian personal name Byzas. Ancient Greek legend refers to King Byzas, the leader of the Megarian colonists and founder of the city. The form Byzantium is a latinisation of the original name. Much later, the name Byzantium became common in the West to refer to the Eastern Roman Empire. Its capital Constantinople stood on the site of ancient Byzantium. The name "Byzantine Empire" was introduced by the historian Hieronymus Wolf only in 1555, a century after the empire had ceased to exist. While the empire existed, the term Byzantium referred to only the city, rather than the empire. The name Lygos for the city, which likely corresponds to an earlier Thracian settlement, is mentioned by Pliny the Elder in his Natural History. 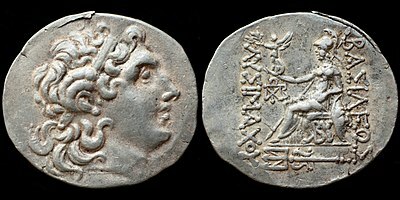 Silver tetradrachm struck in Byzantion c. 150–100 BC. Byzantion struck coins in the name of Lysimachus nearly 200 years after his death. The origins of Byzantium are shrouded in legend. Traditional legend says Byzas from Megara (a city-state near Athens) founded Byzantium in 667 BC when he sailed northeast across the Aegean Sea. The tradition tells that Byzas, son of King Nisos (Νίσος), planned to found a colony of the Dorian Greek city of Megara. Byzas consulted the oracle of Apollo at Delphi, which instructed Byzas to settle opposite the "Land of the Blind". Leading a group of Megarian colonists, Byzas found a location where the Golden Horn, a great natural harbor, meets the Bosporus and flows into the Sea of Marmara, opposite Chalcedon (modern day Kadıköy). He adjudged the Chalcedonians blind not to have recognized the advantages the land on the European side of the Bosporus had over the Asiatic side. In 667 BC he founded Byzantium at their location, thus fulfilling the oracle's requirement. It was mainly a trading city due to its location at the Black Sea's only entrance. Byzantium later conquered Chalcedon, across the Bosporus on the Asiatic side. The city was taken by the Persian Empire at the time of the Scythian campaign (513 BC) of King Darius I (r. 522–486 BC), and was added to the administrative province of Skudra. Though Achaemenid control of the city was never as stable as compared to other cities in Thrace, it was considered, alongside Sestos, to be one of the foremost Achaemenid ports on the European coast of the Bosporus and the Hellespont. Byzantium was besieged by Greek forces during the Peloponnesian War. As part of Sparta's strategy for cutting off grain supplies to Athens, Sparta took the city in 411 BC. The Athenian military later took the city in 408 BC. After siding with Pescennius Niger against the victorious Septimius Severus, the city was besieged by Roman forces and suffered extensive damage in 196 AD. Byzantium was rebuilt by Septimius Severus, now emperor, and quickly regained its previous prosperity. It was bound to Perinthos during the period of Septimius Severus. The location of Byzantium attracted Roman Emperor Constantine I who, in 330 AD, refounded it as an imperial residence inspired by Rome itself. (See Nova Roma.) After his death the city was called Constantinople (Greek Κωνσταντινούπολις, Konstantinoupolis, "city of Constantine"). This combination of imperialism and location would affect Constantinople's role as the nexus between the continents of Europe and Asia. It was a commercial, cultural, and diplomatic centre. With its strategic position, Constantinople controlled the major trade routes between Asia and Europe, as well as the passage from the Mediterranean Sea to the Black Sea. On May 29, 1453, the city fell to the Ottoman Turks, and again became the capital of a powerful state, the Ottoman Empire. The Turks called the city "Istanbul" (although it was not officially renamed until 1930); the name derives from "eis-ten-polin" (Greek: "to-the-city"). To this day it remains the largest and most populous city in Turkey, although Ankara is now the national capital. By the late Hellenistic or early Roman period (1st century BC), the star and crescent motif was associated to some degree with Byzantium; even though it became more widely used as the royal emblem of Mithradates VI Eupator (who for a time incorporated the city into his empire). Some Byzantine coins of the 1st century BC and later show the head of Artemis with bow and quiver, and feature a crescent with what appears to be an eight-rayed star on the reverse. According to accounts which vary in some of the details, in 340 BC the Byzantines and their allies the Athenians were under siege by the troops of Philip of Macedon. On a particularly dark and wet night Philip attempted a surprise attack but was thwarted by the appearance of a bright light in the sky. This light is occasionally described by subsequent interpreters as a meteor, sometimes as the moon, and some accounts also mention the barking of dogs. However, the original accounts mention only a bright light in the sky, without specifying the moon. To commemorate the event the Byzantines erected a statue of Hecate lampadephoros (light-bearer or bringer). This story survived in the works of Hesychius of Miletus, who in all probability lived in the time of Justinian I. His works survive only in fragments preserved in Photius and the tenth century lexicographer Suidas. The tale is also related by Stephanus of Byzantium, and Eustathius. It is unclear precisely how the symbol Hecate/Artemis, one of many goddesses would have been transferred to the city itself, but it seems likely to have been an effect of being credited with the intervention against Philip and the subsequent honors. This was a common process in ancient Greece, as in Athens where the city was named after Athena in honor of such an intervention in time of war. Later, while under the Romans, cities in the Roman Empire often continued to issue their own coinage. "Of the many themes that were used on local coinage, celestial and astral symbols often appeared, mostly stars or crescent moons." The wide variety of these issues, and the varying explanations for the significance of the star and crescent on Roman coinage precludes their discussion here. It is, however, apparent that by the time of the Romans, coins featuring a star or crescent in some combination were not at all rare. ^ The Rise of the Greeks. https://books.google.com/books?id=KynUBgAAQBAJ&pg=PT22: Orion Publishing Group. 2012. ISBN 978-1780222752. ^ a b Janin, Raymond (1964). Constantinople byzantine. Paris: Institut Français d'Études Byzantines. pp. 10ff. ^ Georgacas, Demetrius John (1947). "The Names of Constantinople". Transactions and Proceedings of the American Philological Association. The Johns Hopkins University Press. 78: 347–67. doi:10.2307/283503. JSTOR 283503. ^ Room, Adrian (2006). Placenames of the World: Origins and Meanings of the Names for 6,600 Countries, Cities, Territories, Natural Features, and Historic Sites (2nd ed.). Jefferson, NC: McFarland & Company. ISBN 978-0-7864-2248-7. ^ a b Balcer 1990, pp. 599–600. Balcer, Jack Martin (1990). "BYZANTIUM". Encyclopaedia Iranica, Vol. IV, Fasc. 6. pp. 599–600.